Before you can launch a product you've got to CREATE a product. They don't know what niche they want to be in or they don't know a topic for their niche and several other “things” that just keep them from moving forward. Kevin Fehay just taught me something I NEVER thought to do to get a product fast! Note: I'm currently going through his IM Product Launch Training. You can get it for less than $10 by going to http://www.IMWithLiz.com/IMProductLaunching Once you click the order button you'll be brought to the checkout page. Just enter the coupon code LizSpecial and you'll be able to get the entire course for less than $10. Simple… Buy a product someone else has created, but that no one else has the right to sell! You can find sites for sale on Flippa.com where you are the sole owner of the product. You don't have to do any of the product creation, creating your sales page, your download page or any of that stuff! Now it can take time and you'll have to watch Flippa every day for a few weeks to find the perfect product, but it can be done and it is an option where you can have your own product and be on your way to doing a launch for it with just a few tweaks. You've got to have a product before you can start in on the product launch process. I HIGHLY recommend you grab Kevin Fahey's IM Product Launching and learn for less than $10 (if you use my coupon code) all of his tactics for creating your product. He gives you a lot of great ideas and gives you 9 examples of products he's created. This is a killer course, and I'm LOVING going through it! You can get it for less than $10 by going to http://www.IMWithLiz.com/IMProductLaunching Once you click the order button you'll be brought to the checkout page. 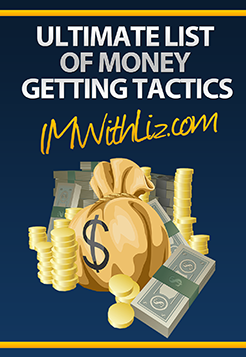 Just enter the coupon code LizSpecial and you'll be able to get the entire course for less than $10. Okay so now that we've covered the first part of things here (creating your product that you're going to launch) we're going to move on and over the weekend I'll be creating a few tutorials about the next part of things. Creating sales copy and setting up a site to sell your product from. Stay tuned because I have some great “techy” tutorials coming for you!